Help your skin retain moisture. 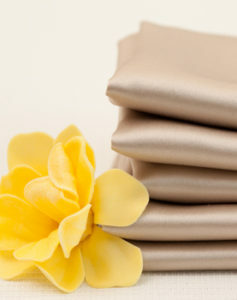 Silk helps keep moisture close to your skin and will help your skin stay more hydrated than many fabrics on the market. Sleeping on silk is great option for helping your skin maintain its natural moisture. Save money on expensive moisturizing creams by retaining more moisture in your face to begin with, by sleeping on silk pillowcases. Reduce your chemical exposure. We constantly come into contact with chemicals, but you can reduce that chemical exposure during your night’s sleep. Silk is produced from domesticated silk worms that are bred and raised in captivity. They have no predators to defend against and are pampered throughout their life, helping to produce a fine silk fiber with little chemical exposure. In contrast, many fabrics on the marketplace, are produced from chemically intensive crops that require pesticides, herbicides and other chemical treatments before making it to your bed sheets. So when it comes to luxury bedding, this is one of those cases where less really is more. Silk can be beneficial for your skin and hair. Sleeping on a silk pillowcase can help your skin stay healthy and smooth and can help reduce the appearance of facial wrinkles. If you’re only going to invest in one piece of silk bedding to start with, the silk pillowcase provides a lot of benefit for the cost. It’s a true luxury experience. Sometimes we treat ourselves to a massage, a relaxing day at the beach or a quiet evening in the bathtub. 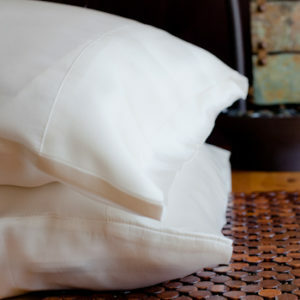 Whatever your escape, laying your head to rest at night on a silk pillowcase is the perfect way to end your day. There is no better feeling then the soft, smooth and luxurious feel of silk against your skin when you go to bed at night. It is truly like having a massage every night. Reduce bed head and split ends. Are you tired of waking up in the morning and having hair that looks like you just stuck your finger in a socket? Sleeping on luxury silk pillowcases will help keep that bed head under control. The natural properties of silk, including its smooth surface, can help reduce friction on your hair which often causes damage, like spilt ends. For your hair, it truly does pay to sleep on a silk pillowcase. They’re easy to care for. While a Charmeuse silk dress may require some special handling, LovaSilk pillowcases are made from a heavy 19 momme weight silk that can be machine washed. So you don’t need to worry about going to the dry cleaner, just pop it in to your washer and you’re good to go. For complete care instructions, see our guide to caring for your silk products. It’s a great value. There is no other fabric on the planet that is more luxurious than silk, and there is no part of your luxury bedding set that is more important than the pillowcase. When you purchase a silk pillowcase, you are getting the best quality fabric on the planet for the most critical part of your sleep experience. What other small investment can you make that will have so much impact on your skin and hair over a long period of time–and for less than a $100? Thank you this advice. I bought 2 silk pillow cases today because my hair was so frizzy in the mornings. I look forward to my first nights sleep to see the results.